Australia was not only a blast, but I learned a ton! The course was Sports Marketing and the length of stay was 10 days. We had many guest speakers from the Sydney Swans, Australian Rugby League, Warratohs, Rabitohs (Russel Crowe’s team), MLB, US Consulate, Commonwealth Bank, and speakers from the University of Technology Sydney. OE also had a professor on staff who was a member of our group for the duration of the trip. The OE professor oversaw our project and made sure we were on the right track. The project was in conjuction with the Sydney Swans, an AFL Team. We broke into teams and designed surveys to gather data from local SydneySiders to poll their opinion on both the AFL and The Swans. There were three different days to survey the SydneySiders and on the final day, we asked these questions at a Swans game. At the end of the trip, we presented our findings to the Swans. Outside of class time, we toured Australia. Our Hostel was right across the street from Central Station so we mostly used the train as transportation. We went to both a AFL and Rugby game, toured the opera house, walked across the harbour (Australia Spelling), visited Manly Beach, shopped downtown, and spent a few hours touring on our own. As part of the trip, we traveled to Cairnes (pronouced “Cans”). Cairnes is more of a beach flavored town and was very laid back, something you might expect while in Florida. In fact, it was so small the airport didn’t have gates. You simply walked off the plane onto the tarmac. While in Cairnes we visited a wildlife reserve which allowed us to take a duck tour of the rainforest, watch Aboriginals throw spears, teach us how to throw a boomerang, finally watch them perform aboribinal dances while playing the didjeridoo (which is the “Sound of Australia” and is pronouced “did-jer-e-do”). The highlight of the wildlife park was of course the zoo which held kangaroos, Koala bears, crocodiles, and other species. We were able to spend a long time on petting the Kangaroos and even got to hold a Koala. The next day in Cairnes we went scuba diving in the Great Barrier Reef. The boat ride was 2 hours and was very rough, but it was so worth it. When we got there, we had the option to scuba or snorkle and many of us did both. Scuba diving did not need certification and we went down in groups of 4 with a guide. It was awesome! We were inches from the reef and I almost got eaten by a giant clam! Snorkeling left you about a foot from the reef and you could stop to take breaks at the beached island. Lunch was on the boat and it led to a very relaxed afternoon. The very next day in Cairnes was our last and we spent the afternoon finishing our projects. After we finished our projects, we ventured up into the rainforest to bungee jump. The bungee was set up above a small pond which you would later touch after almost reaching the ground. Great fun! We traveled back to Sydney after Bungee jumping as the next two days would be the remainder of the trip. We spent that time touring and on the last day, prepared to give our presentation. This trip was very well planned out and the director was very connected. The tuition for the trip seems expensive for 10 days, but it includes 3 meals a day, accomodation, travel while in Australia, and all activities (unless you wanted to purchase something extra). If you enjoyed your time in Australia, you had the option to continue your experience to both New Zealand and Fiji. This trip would be perfect for Freshmen or Sophmores interested in Marketing. I am a CIS Major but still had fun! 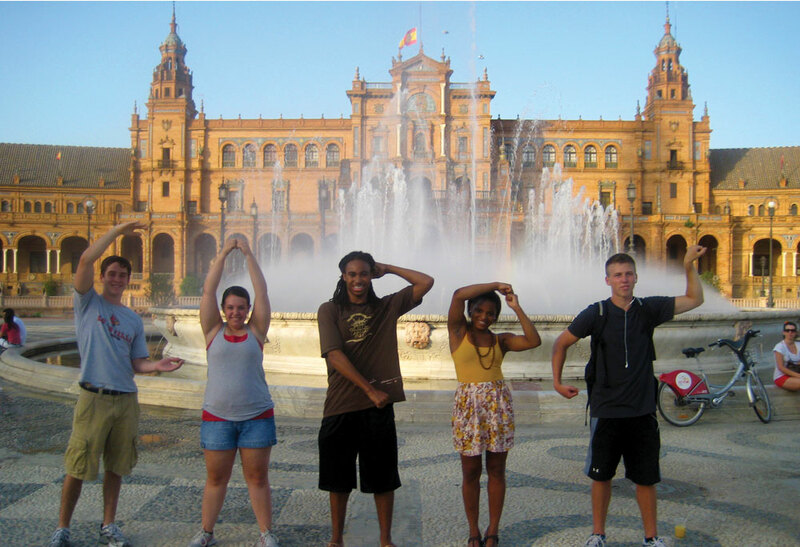 This entry was posted in Study Abroad by jmbish04. Bookmark the permalink.